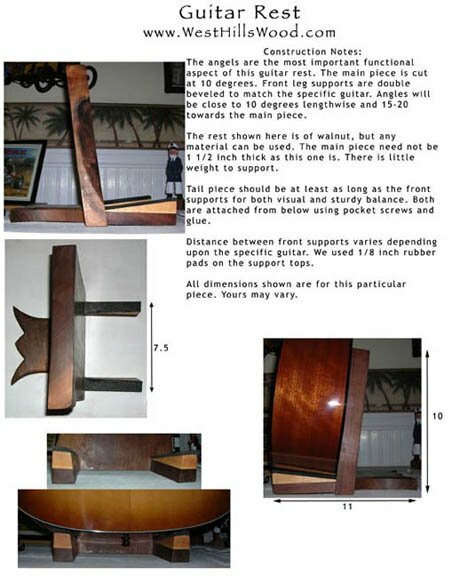 Our West Hills Wood guitar rest plans have been emailed to woodworkers around the world. We decided to post the plans online and encourage folks to build their own without the extra step of email. A larger, higher resolution version of this page is available. Our musician friends make odd faces when first seeing a guitar rest but soon come to realize how nice it is to have something this unique and useful. True, there's not much to this project. That's because it is a simple and elegant design. There are some subtle assembly adventures you will need to confront. If you run into a problem while trying to make your own, contact us and we'll get back to you as soon as we can.